Brief Summary: After bedding down on the night of September 14, 1864 just west of Rowanty Creek, Hampton’s Confederate troopers got an early start on the morning of September 15, 150 years ago today. Hampton’s men crossed Wilkinson’s Bridge and headed past Belsche’s destroyed mill, a site they’d see more of on their return. 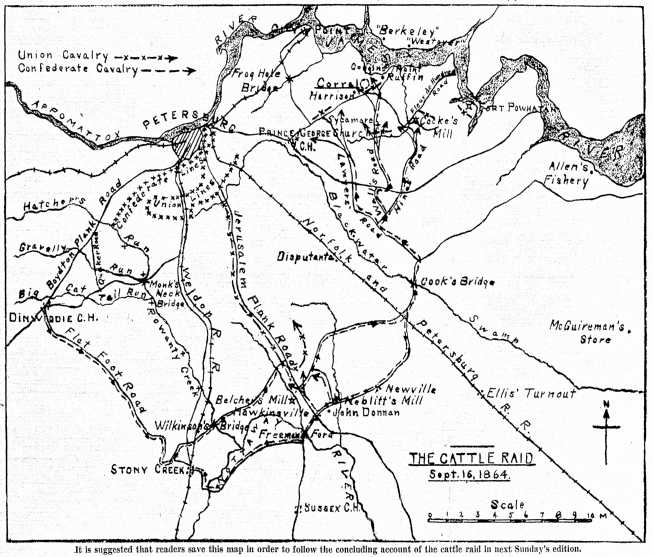 After reaching the Jerusalem Plank Road, the column utilized that thoroughfare for a bit before turning off onto the road toward Cabin Point and a destroyed bridge over the Blackwater on the afternoon of the 15th. That destroyed bridge, and its rebuilding, was the key to the entire operation. Hampton had deliberately chosen this route to cross the Blackwater, because he knew that the Yankees knew this bridge had been destroyed and was impassable. Hampton brought along handpicked “mounted engineers” commanded by Lt. John F. Lanneau, an engineer on Hampton’s staff. These men were given the appropriate tools prior to the expedition and now set to work rebuilding the bridge over the Blackwater. While this bridge work was ongoing, Hampton gathered his subordinates and explained the plan. Rosser’s Brigade and the handpicked men from Young’s and Dunovant’’s brigades under Lt. Col. Miller of the 6th South Carolina Cavalry would overwhelm the 1st District of Columbia Cavalry at Sycamore Church, then head north to rustle the cattle at Coggins’ Point. Rooney Lee’s Division would head northwest up Lawyer’s Road and guard the left flank near Prince George Court House. This was the direction of the main Union army and the supply depot at City Point, and more trouble was expected in this vicinity than any other. James Dearing’s brigade was to head northeast to Cocke’s Mill and block the road to Fort Powhatan to the northeast. Fort Powhatan, erected on the James River, was also thought to be a potential, though lesser, source of trouble. Once Rosser et al had gathered up the cattle and had a good head start, Lee and Dearing would be recalled and the whole force would beat a hasty retreat to the Confederate lines. Lanneau’s men worked hard and had finished a suitable bridge over the Blackwater by nightfall. Hampton’s Confederate troopers crossed this previously impassable waterway and headed northeast. When the column reached Lawyers Road, they split up. Lee headed northwest on Lawyers Road towards Prince George Court House to set up his blocking position, while Rosser, Miller’s picked men, and Dearing moved northeast. They too would eventually split so that Rosser et al faced Sycamore Church in the center, and Dearing faced Cocke’s Mill on the right. The 1st District of Columbia Cavalry, about 400 men, guarded Sycamore Church and Cocke’s Mill. Major J. Stannard Baker led two battalions at Sycamore Church while Captain Will S. Howe and the remaining battalion were camped at Cocke’s Mill. 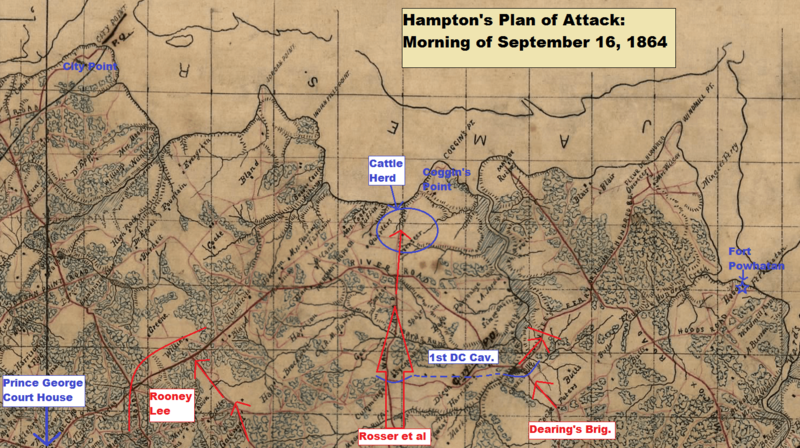 As Hampton prepared to attack, the sleeping men of the 1st DC Cavalry had no idea what was about to hit them…but that is a story for tomorrow, September 16.